So I usually run a 6094 when not in Russian kit but wanted something a little less bulky. The Haley Strategic DC3 seemed ideal but there was no way I was paying £150 for a few pouches! So I looked at the TMC copy which cost £32 off ebay. Firstly, as you can see it does take AK74 mags easily and these are GHK ones so are slightly bulkier than AEG mags. Secondly, the bungees on the mag pouches are useless unless retied but aren't really necessary at all. The pistol pouch ones are just as bad. Thirdly, the admin pouches are tiny. Enough room in them for 2 pistol mags. The stretch pouch is really useful. 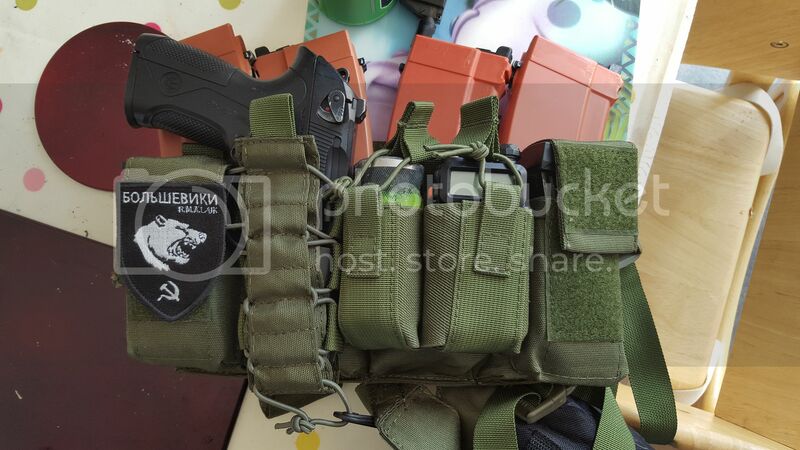 As you can see I have my radio and BFG in the two pistol pouches with my pistol in the stretch pouch and mags in the admin pouches.